Cellular cobalamin defects are a locus and allelic heterogeneous disorder. The gold standard for coming to genetic diagnoses of cobalamin defects has for some time been gene-by-gene Sanger sequencing of individual DNA fragments. Enzymatic and cellular methods are employed before such sequencing to help in the selection of the gene defects to be sought, but this is time-consuming and laborious. Furthermore some cases remain undiagnosed because no biochemical methods have been available to test for cobalamin absorption and transport defects. This paper reports the use of massive parallel sequencing of DNA (exome analysis) for the accurate and rapid genetic diagnosis of cobalamin-related defects in a cohort of affected patients. The method was first validated in an initial cohort with different cobalamin defects. Mendelian segregation, the frequency of mutations, and the comprehensive structural and functional analysis of gene variants, identified disease-causing mutations in 12 genes involved in the absorption and synthesis of active cofactors of vitamin B12 (22 cases), and in the non-cobalamin metabolism-related genes ACSF3 (in four biochemically misdiagnosed patients) and SUCLA2 (in one patient with an unusual presentation). We have identified thirteen new variants all classified as pathogenic according to the ACGM recommendation but four were classified as variant likely pathogenic in MUT and SUCLA2. Functional and structural analysis provided evidences to classify them as pathogenic variants. The present findings suggest that the technology used is sufficiently sensitive and specific, and the results it provides sufficiently reproducible, to recommend its use as a second-tier test after the biochemical detection of cobalamin disorder markers in the first days of life. However, for accurate diagnoses to be made, biochemical and functional tests that allow comprehensive clinical phenotyping are also needed. Cellular cobalamin problems are caused by nutritional deficiency or genetic defects that affect either the absorption or cellular uptake of the vitamin or the synthesis from it of methylcobalamin (MeCbl) and adenosylcobalamin (AdoCbl). The latter are, respectively, a cofactor of methionine synthase (MS EC_2.1.1.13), which catalyzes the remethylation of homocysteine (Hcys) to methionine in the cytoplasm, and of methylmalonyl-CoA mutase (MUT EC_5.4.99.2), which catalyzes the mitochondrial isomerization of L-methylmalonyl-CoA (MMACoA) to succinyl-CoA. Defects in the synthesis of AdoCbl or the conversion of MMACoA to succinyl-CoA lead to elevated methylmalonic acid (MMA) concentrations, while defects in the synthesis of MeCbl or the remethylation of Hcys to methionine cause elevated Hcys (HC). Defects in the absorption and transport of vitamin B12, and in the cytosolic synthesis of the above cofactors, cause methylmalonic aciduria with homocystinuria (MMA&HC) [1, 2]. After its intake, cobalamin is first bound to haptocorrin (encoded by TCN1) and then to the intrinsic factor (IF) encoded by GIF. To date, only one pathogenic mutation and one functional polymorphism (p.Asp301Tyr in TCN1) have been described [3, 4]. Cubilin and amnionless, encoded by CUBN and AMN respectively, form the cubam dimer which functions as the receptor of IF-Cbl in the ileum . The IF is then degraded and vitamin B12 appears in the blood stream associated with transcobalamin II (TCII) [2, 5]. Inherited malabsorption of cobalamin causes haematological and neurological abnormalities that can be fatal . Still bound to TCII, the vitamin enters cells via transcobalamin receptor (TCblR)-mediated endocytosis. This receptor is encoded by CD320, for which only one mutation has been described . The cobalamin is then released into the cytosol, an event impaired in people with defects in LMBRD1 (cblF complementation group, MIM #277380) . LMBRD1 protein interacts with ABCD4 protein, which is also involved in the release of Cbl into the cytoplasm from the lysosomes (a defect which falls into complementation group cblJ) . The most common form of cobalamin defect, complementation group cblC (MIM#277400), is caused by mutations affecting MMACHC . Patients with mutations in the Host Cell Factor 1 (HCFC1) locus (MIM 309541), located on the X chromosome, have a phenocopy of cblC disease  since HCFC1 encodes a transcriptional co-regulator of MMACHC. Recently additional defects have been described that affect transcription factors involved in the regulation of Cbl pathway: ZNF143  and THAP11 . In addition new variants in PRDX1 also affect the expression of MMACHC, named epi-cblC cases. Thus, these patients result from pathogenic variants in MMACHC and one in PRDX1 which force the antisense transcription of MMACHC and thereby a possible methylation mark . Cellular cobalamin processing occurs via two major pathways - the cytosolic and mitochondrial pathways. The protein thought to be responsible for sorting cobalamin for these pathways is MMADHC (cblD complementation group, MIM #611935). This complementation group is the most complex of all since patients present with biochemical heterogeneity ranging from isolated homocystinuria (cblD variant 1) or isolated methylmalonic aciduria (cblD variant 2) through to methylmalonic aciduria combined with homocystinuria (cblD) depending on the nature and location of the mutations present . The cytosolic pathway is involved in the synthesis of MeCbl by MS, encoded by MTR (defects give rise to complementation group cblG), while the enzyme methionine synthase reductase encoded by MTRR is involved in the reactivation of MS (defects give rise to complementation group cblE). Both cblG (MIM#250940) and cblE (MIM#236270) defects, lead to elevated Hcys, hypomethioninaemia, and megaloblastic anaemia [1, 2]. Inactive cob(II)alamin entering the mitochondria is converted into AdoCbl via a reductive adenosylation reaction catalysed by an adenosyltransferase (ATR) encoded at the cblB locus (MIM#251110) . MUT is encoded at the MUT locus and two different phenotypes have been described: mut0 and mut− (MIM#251100). Finally MMAA is the gene associated with complementation group cblA defects (MIM# 607481). It encodes a protein of the same name which may be involved in transferring AdoCbl from ATR to MUT protein as well as maintaining MUT’s functional integrity [5, 17]. Mildly elevated MMA also occurs in patients with mutations affecting SUCLA2 (MIM#612073) and SUCLG1 (MIM#245400) which lead to infantile mitochondrial encephalopathic depletion syndrome. These genes encode either the ß-subunit of ADP-forming or the α-subunit of GDP-forming succinyl-CoA synthetases. The accumulated succinyl-CoA inhibits the metabolism of MMACoA to succinyl-CoA, leading to the accumulation of MMA in body fluids. Mutations in SUCLA2 give rise to typical (though rare) early onset dystonia combined with deafness [18, 19]. An increase in MMA is also seen in patients with mutations in ACSF3 (MIM# 614265), in whom malonic acid levels may also be elevated (combined malonic and methylmalonic aciduria, CMAMMA) . ACSF3 encodes a mitochondrial acyl-CoA synthetase considered to have malonyl-CoA and MMACoA synthetase activities. The diagnosis of an intracellular cobalamin metabolism disorder in a symptomatic individual is based on both clinical suspicion and biochemical analyses [1, 21]. Since expanded newborn screening potentially allows early detection of certain disorders of intracellular cobalamin metabolism, some affected individuals may be diagnosed prior to the onset of clinical symptoms. Diagnosis is based on elevated propionylcarnitine (C3), a high propionylcarnitine to acetylcarnitine ratio (C3/C2), high heptadecanoylcarnitine (C17), and/or reduced methionine concentrations . After symptomatic or asymptomatic detection, a differential diagnosis is needed to help identify the gene that might be involved. Confirmatory testing is based on measuring Hcys and MMA in plasma and/or urine, enzyme analyses, the incorporation of [1-14C] propionate and [5-14C] methyl-THF into proteins in fibroblasts cultured in basal and hydroxocobalamin-supplemented media, and in some cases by cellular complementation assays . However, biochemical analysis cannot pinpoint a genetic defect, making diagnosis complicated. Fortunately, recent developments in high-throughput sequence capture have made next generation sequencing (NGS) a rapid and accurate means of analysing genetic locus and allele heterogeneous disorders [23–25]. The main purpose of clinical laboratory testing is to support medical decision-making. Clinical genetic testing is generally used to identify or confirm the cause of a disease and, if possible, to provide ideas for personalized treatment. Massive parallel sequencing is the starting point of a complex process for identifying pathogenic variants as well as the description of new functions for a gene product . The aim of the present work was to assess the use of genetic studies as second-tier tests following the detection of cobalamin disorders in biochemical newborn screening. The usefulness of massive parallel sequencing in the identification of the mutated genes responsible for cobalamin and related defects was analyzed, and the structural and functional analysis of the novel variants identified undertaken. Patient-derived fibroblasts, blood samples or dried blood spots from 27 patients with elevated MMA and/or Hcys or vitamin B12 deficiency were referred to our laboratory for genetic analysis. Another 9 samples from patients with cobalamin defects, previously diagnosed in our laboratory, were included for validation purposes. The diagnosis of these cases was made by biochemical, cellular and genetic studies. Fourteen cases were detected through expanded newborn screening programs; the others were diagnosed after clinical presentation (neonatal or late onset). The study was approved by the ethics committee of the Universidad Autónoma de Madrid. The participants or their legal guardians gave their signed, informed consent to be included. High purity DNA was extracted from whole blood, fibroblasts or dried blood spot samples using the MagNA Pure Compact Kit (Roche Applied Biosciences, Indianapolis, IN) following the manufacturer’s protocol. Two massive parallel sequencing panels were used: targeted customized exome sequencing to capture the exome of 120 genes involved in metabolic disorders (Nextera Nature Capture, Illumina, San Diego, California, USA) (the list of genes included can be sent upon request), and an extended panel (Clinical-Exome Sequencing TruSight™ One Gene Panel, Illumina) that included all the known (in 2013) disease-associated genes described in the OMIM database (Mendeliome panel). For genetic analysis in the validation cohort both panels were used. For genetic analysis in discovery cohort either of the two panels was used, except in cases P24-P27 where both panels were used. After gene capture and alignment with the reference genome, variant callings were made using a virtual panel that included all cobalamin metabolism and related genes. Incidental findings in genes unrelated to the clinical/biochemical phenotypes were ignored. Additional files 1 and 2 describes the coverage of the genes. With both panels, the libraries generated were sequenced using 150 bp paired-end reads employing the Illumina MiSeq or Nextseq500 NGS platforms. SNVs was annotated and subsequently filtered as previously described . Variants were always confirmed by conventional Sanger sequencing employing both patient genomic DNA and that of their parents if available. Pathogenic prediction was assessed by Alamut Visual software. Variants were classified following the ACMG recommendation guidelines [27, 28]. To assess the isolated effect of the recently described mutation c.1084-10A > G in MUT , the splicing profile was analyzed ex vivo using a minigene assay. Briefly, exon 6 and the corresponding flanking intronic regions from patient P10 were amplified as previously described and cloned into pSPL3 vector . Transcriptional profile analysis was performed as described elsewhere . The oxygen consumption rate (OCR) was measured using the XF24 Extracellular Flux Analyzer (Seahorse Bioscience, Billerica, MA, USA) as previously described  in cells transduced with lentiviral particles incorporating wild-type cDNA of SUCLA2 (NM_003850) or the respective negative control. Modulating compounds such as oligomycin inhibitor of the ATP synthase (OL, 6 μM), carbonyl cyanide 4-(trifluoromethoxy) phenyl-hydrazone a potent uncoupler of oxidative phosphorylation in mitochondria (FCCP, 50 μM), rotenone inhibitor of complex I (RO, 1 μM) and antimycin A inhibitor of complex III (AT, 1 μM) were used to assess the bioenergetic profile and were sequentially added to the cells. The calibration plate for these compounds was prepared according to the manufacturer’s protocol. The data obtained were used to determine basal OCR, the maximum respiratory rate, ATP-linked respiration, mitochondrial reserve capacity, proton leakage and non-mitochondrial respiration. Briefly, for OCR determinations, patient-derived skin fibroblasts (5 × 104 each), were seeded per well in 24-well tissue culture microplates and incubated with 100 μl DMEM supplemented galactose (1 g/L g/l, DMEM-Gal) instead of glucose at 37 °C for 2–5 h. After the incubation period, up to 250 μl of the corresponding medium was added and incubated overnight at 37 °C. On the next day, the medium was removed and the cells washed with phosphate saline buffer (PBS). 700 μl of the corresponding medium DMEM-Gal without bicarbonate were then added and the plates incubated at 37 °C for 1 h.
The novel intronic and exonic SNVs identified were analyzed using Alamut Visual software, which includes a number of functional predictors. The two SUCLA2 variants (p.Gly326Arg, p.Ile312Thr) were mapped to a homology model of the human protein based on the known X-ray structure of SUCLG2 (S. scrofa; PDB code: 2fp4) . The percentage sequence identity between these proteins was 54% . To assess the sensitivity of the proposed assay in the detection of pathogenic mutations, all mapped sequence reads from the nine samples (VC1–9) with previously defined mutations in TCN2, MTR, MTRR, MMACHC, MMADHC, MUT, MMAA and MMAB (Table 1) (11 known and three unknown mutations detected by conventional Sanger sequencing) were inspected blind. Samples for the validation cohort were selected to include different types of Cbl deficiency. All the previously known mutations in all samples were detected in their correct heterozygous/homozygous state. Adult with slight anemia and low serum vit B12. The discovery cohort consisted of samples received for cobalamin genetic diagnosis, for which no mutations were previously known. Variant changes were identified in the cobalamin transport genes i.e., TCN1, GIF and AMN, in genes causing isolated MMA i.e., MMAA, MUT and MMAB, in genes causing MMA&HC i.e., CD320, MMACHC, MMADHC, in genes causing HC i.e., MTRR, and in two MMA metabolism-related genes SUCLA2 and ACSF3 (Table 1). Some variants in MMACHC, MMADHC, MUT, MTRR and ACSF3 were detected in several samples. In some cases DNA from blood spots was used in parallel; the coverage compared to whole blood was similar. Overall, 33 variations were identified in 12 different genes. All the new exonic non-synonymous SNVs (nsSNVs) were predicted to be pathogenic or likely pathogenic (Additional files 1 and 3). Among 27 samples with biallelic nucleotide changes, 21 showed at least one described (HGMD® professional release professional release 2018.1) or one new LoF mutation. Three samples (P6, P9 and P23) presented two new variants in MUT or SUCLA2. A previously described functional SNP in TCN1 was detected in two samples (P1 and P2) . Although this disease-associated polymorphism was not detected in the in-house control samples analysed, this variation is present close to 9% in all data base consulted (ExAc, gnomAD and Spanish data) with presence of homozygous cases. Therefore this change alone in TCN1 is unlikely to be responsible for the clinical picture in P1 and P2. P11 (identified by newborn screening) presented the previously described nonsense mutation p.Arg152Ter in MUT, plus the disease-associated polymorphism in TCN1 described above. Both changes were present in the paternal sample. No other exonic or described intronic mutation were detected. Mean coverage allowed to rule out a large genomic deletion. It was not possible to rule out the presence of deep intronic mutations. Four patients (P24, P25, P26 and P27) referred for analysis of genes related to isolated MMA in fact had mutations in ACSF3. After the genetic diagnosis, a slight increase in urinary malonic acid was confirmed by GC-MS in three of them. The effect of mutation c.1084-10A > G identified in P10 on the splicing process was addressed using an ex vivo minigene system. The results indicate the insertion of a 9 nt sequence upstream of the normal 3′ splice site, as recently described by transcriptional profile analysis in patient-derived fibroblasts . A shorter transcript was also observed, resulting from the deletion of 135 nt from exon 6. This was detected as a heteroduplex along with the normal transcript. This deletion was generated by the activation of an internal exonic cryptic 3’splice with a higher splicing score than normal, plus two exonic splicing enhancer sequences (Fig. 1).This deletion would likely translate into the elimination of 45 amino acid residues from the protein. To assess the bioenergetic profile of patient P23, and to determine whether mitochondrial function could be restored by the transfection of patient-derived fibroblasts with a lentiviral construct bearing wild-type SUCLA2 cDNA, the oxygen consumption rate (OCR) of control and patient derived-fibroblasts (transduced or not with the lentiviral construct) was analyzed. In order to force the functioning of the electron transport chain, this experiment was performed in a medium supplemented with galactose. Fig. 2a shows that P23-derived fibroblasts had a diminished bioenergetic profile compared to control cells. Basal respiration was significantly reduced (Fig. 2b). The addition of FCCP to the medium resulted in increased electron flow through the mitochondrial respiratory chain and allowed the maximum respiration rate to be calculated. Figure 2b shows this variable to also be significantly reduced in P23 fibroblasts. Oligomycin-sensitive respiration (OSR), which represents the ATP-linked oxygen consumption (Fig. 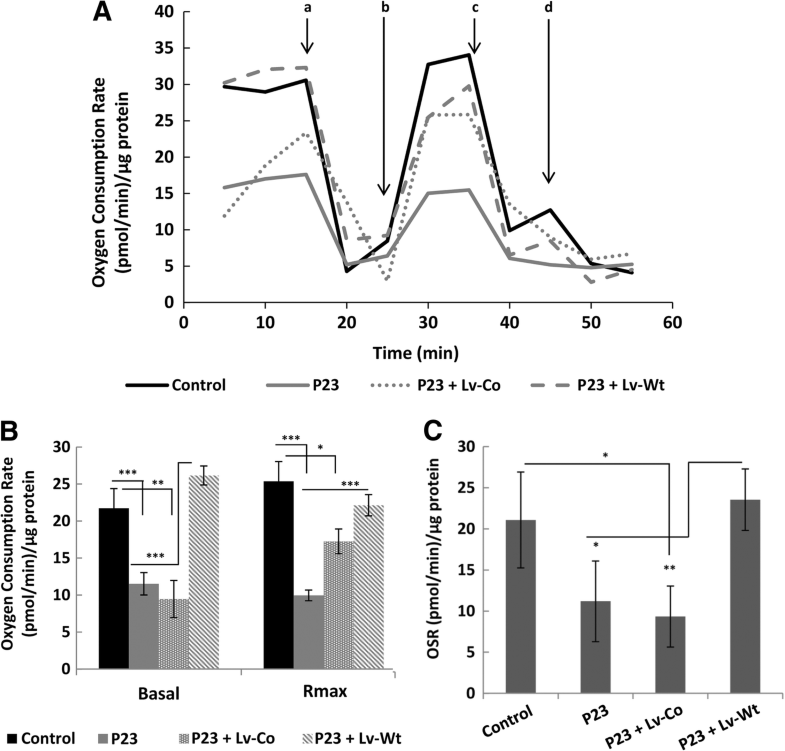 2c), was also reduced in P23 cells, indicating reduced oxidative phosphorylation. The transduction of patient dermal fibroblasts with an empty construct (Lv-Co) did not influence the bioenergetic profile, except for an increase in the maximum respiration rate which was still below control levels. Transduction with the lentiviral construct bearing wild-type SUCLA2 cDNA, however, was able to restore the bioenergetic profile (Fig. 2a). Both basal and maximal respiration rates were restored to control levels (Fig. 2b). As shown in Fig. 2c, oligomycin-sensitive respiration was also significantly increased, suggesting the restoration of oxidative phosphorylation. These results indicate that the bioenergetic deficit observed in the cells from P23 could be caused by defects in SUCLA2. 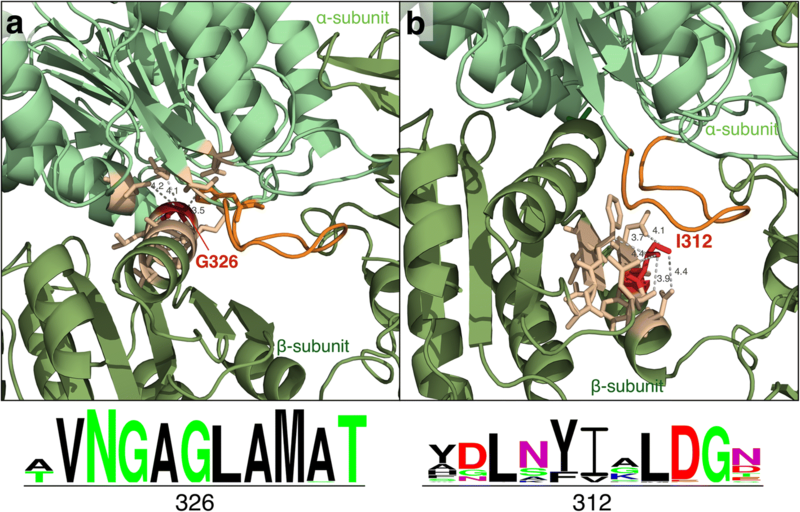 Structural analysis of the SUCLA2 variants was performed for prediction of protein dysfunction at the molecular level. The functional and in silico analyses of the two SUCLA2 variants also suggested them to be damaging. Only AlignGVGD gave a nearly neutral score for p.Ile312Thr. It should be noted that the pathogenicity score for this variant was closer to the threshold between neutral and damaging replacements, suggesting a milder effect (Additional file 1). This observation agrees with the results of the structural analysis. The wild type residues Gly326 and Ile312 were identified in a homology model of SUCLA2, obtained using pig SUCLG2. Visual analysis of the structures (Fig. 3) showed that both loci fell near the protein’s “phosphate shuttle” loop , indicating that the replacement of the wild-type residue might interfere with the functional role of this loop. This was particularly noticeable for Gly326, which lies in close contact with residue His299 of the loop, and occurs at a packed location in the structure. The replacement of glycine by the bulkier arginine would undoubtedly create some steric clashes. Gly326 was found to be highly conserved in multiple sequence alignments of the SUCLA2 family, supporting the idea that it may have a functional role. Finally, Ile312 was involved in a dense network of residue interactions, although no close contact (<5Angs) with the residues from the functional “phosphate shuttle” loop was observed. This indicates, once again, that replacement of Ile312 may have a milder impact on function. This agrees with the less strict conservation pattern seen in multiple sequence alignments. In summary, agreement was seen between in silico predictions and structural analyses for both variants, indicating that the observed replacements are pathogenic, although p.Gly326Arg probably causes more severe problems than p.Ile312Thr. The gold standard for coming to genetic diagnoses of cobalamin defects has for some time been gene-by-gene Sanger sequencing of individual DNA fragments. Enzymatic and cellular methods are employed before such sequencing to help in the selection of the gene defects to be sought, but this is time-consuming and laborious . Further, no biochemical methods have been available to test for cobalamin absorption and transport defects, and while plasma B12 concentrations are tentatively used to help in the selection of genes to be sequenced, this has probably led to the under-recognition of cases . This costly, stepwise, and time-consuming methodology is gradually being replaced by NGS technologies, which offer higher throughput and scalability, cost less per sequenced nucleotide and have shorter turnaround times . The present work reports the NGS analysis of a cohort of patients suspected of having cobalamin defects (plus the corresponding structural/functional analyses for some of the defects involved) and shows it to be quick and reliable. A 100% correct diagnostic rate was returned with the validation cohort, with exonic and intronic nucleotide changes and small deletions (c.271dupA in MMACHC or c.57_64del8 in MMADHC) all successfully detected. With the clinical exome massive parallel sequencing system used, the depth and breadth of coverage of the cobalamin metabolism-related genes was > 30× and 99% respectively. The sensitivity and specificity of the method appeared to be very good and the results reproducible (several mutations were detected in more than one unrelated mutant allele i.e., c.271dupA in MMACHC, c.671_678dupAATTTATG in MUT, c.748C > T in MMADHC etc.). Thus, even though the use of smaller, specific panels is recommended  so that secondary incidental findings are avoided, the present work shows clinical exome sequencing to be successful. It could be used in sequencing analyses of single patients as well groups of patients whose members have other, unrelated disorders. The LoF mutations detected in GIF and AMN were found to affect the absorption of cobalamin. GIF and AMN, in addition to CUBN and TCN1, are not usually captured in the available panels offered by genetic companies but the results reported in the present work have demonstrated they should be analyzed [19, 34]. The potential missense changes p.Ala302Pro and p.Ala676Thr, identified in MUT, were predicted to be damaging by several bioinformatic algorithms. The present detection of the associated mutations in combination with functional cellular studies provided a rational basis for tailored treatment. Indeed, the cellular uptake of 14C-propionate revealed that p.Ala302Pro is a mut0 mutation, while p.Ala676Thr located in the C-terminal of the cobalamin binding domain is likely a mut− mutation. Based on these results, patient P6 might not be responsive to the pharmacological administration of the vitamin, while P9 would likely respond. Case P11 inherited a described LoF mutation in MUT and the functional polymorphism p.Asp301Tyr in TCN1, probably an incidental finding of no clinical significance. This asymptomatic individual was detected in newborn screening. No other mutations were detected in the coding region of MUT, not even in the deep intronic sequence reported to bear an intronic pathogenic mutation [30, 37]. Although massive parallel sequencing exome analysis cannot rule out the presence of other nucleotide changes in promoter or intronic sequences, both the absence of clinical symptoms and the slight abnormal levels of urinary MMA in case P11 suggested he/she was a carrier of the disease. Variations in genes that do not encode cobalamin metabolism-related proteins (ASCF3 and SUCLA2) were also detected in the present work. Both were associated with slightly increased urinary MMA. The two new variants of SUCLA2 (p.Gly326Arg and p.Ile312Thr) detected are probably damaging changes; both were predicted to be so in bioinformatic and structural analyses. Neither was found to be present in database control populations nor in the in-house control samples. Structural analysis suggested that the replacement of Ile312 may have a mild functional impact, which agrees with the less strict conservation pattern seen in multiple sequence alignments. Importantly, the mitochondrial dysfunction in deficient fibroblasts from P24 was rescued via the stable expression of the SUCLA2 protein through lentiviral transduction. This suggests that SUCLA2 is the gene likely affected in this patient, although his/her symptoms were atypical [18, 38]. With respect to ASCF3, individuals P24, P25, P26 and P27 were diagnosed as having isolated MMA since the urinary malonic acid that identifies CMAMMA can be easily missed . Given the difficulty in diagnosing CMAMMA, several of the present patients were originally diagnosed during genetic analyses, e.g., exome sequencing . Even though a new method for the rapid metabolic diagnosis of CMAMMA has recently been reported , diagnoses by genetic analysis would be improved by second tier genetic testing after newborn screening. In some cases ACSF3 defects only cause biochemical conditions such as short-chain acyl-CoA dehydrogenase deficiency  or 3-methylcrotonylglycinuria , and symptoms appear only during viral infections etc. [39, 43]. In other cases, as reported in the present work, patients can show neurological damage . Prompt diagnosis would avoid unnecessary treatment with vitamin B12. The use of massive parallel sequencing in a new era of newborn screening would avoid the time-consuming biochemical and enzymatic methods presently used to help identify which genes might be causing isolated MMA, MMA&HC, HC or CMAMMA. The rapid return of an accurate genetic diagnosis would allow the prescription of an appropriate treatment just a few days after birth. This report illustrates the clinical usefulness of massive parallel sequencing in the diagnosis of cobalamin and related defects. This powerful technology could improve the detection of these under-recognized or rare vitamin B12 defect conditions. This work provides evidence supporting the use of massive parallel sequencing as second tier test for confirming cobalamin defects following their detection in newborn screening. Biochemical and cellular analyses and additionally comprehensive phenotyping are needed for an accurate classification of variants for making fully useful clinical reports. Sandra Brasil, Fátima Leal, Begoña Merinero and Belén Pérez contributed equally to this work. An institutional grant from the Fundación Ramón Areces to the Centro de Biología Molecular Severo Ochoa, and funding from the European Regional Development Fund, are gratefully acknowledged. This work was funded by grants PI13/01239-PI16/00573; Fundación Isabel Gemio-Fundación La Caixa (LCF/PR/PR16/11110018). SB, FL, AV, RN, MJE carried out the functional and genetic studies; CR, NP, XC, participated in the structural studies; MLC, EMH, AM, CP, LPQ, MR, NE, IT IV, RY: clinical diagnosis; follow-up pf the cases; PRP, LR, MU, CPC participated in the biochemical diagnosis; BM and BP conceived the study, participated in its design and coordination, interpreted of results and writing the manuscript. All authors read and approved the final manuscript. The study was approved by the ethics committee of the Universidad Autónoma de Madrid (CEI48–919). The participants or their legal guardians gave their signed, informed consent to be included.